Those who had been looking forward to studying with me, I'm so sorry. In Japan, we call the handycraft, like knitting and sewing, "SHUGEI." So, we both can say that we are good at "SHUGEI." takes a lot of time compared to Japanese "a". By the way, from today ＜Aug. 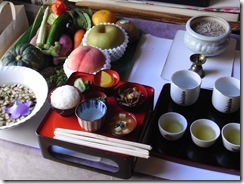 13th＞ to Aug. 16th, in Japan, there is a holiday called "Obon-yasumi." Perhaps everyboday joined in today's class at International Institution already know about this holiday. The ancestors (the people who have passed away) come home during "Obon-yasumi." So, we don't visit their graves. The ancestors come home in the evening of Aug. 13th, come back where their family is waithing for them, and stay until the evening of Aug. 16th, then go back to heaven(where we believe that they live after they had passed away). My grandfather, grandmother, and my elder brother come back to my parents' house. So, today, after the class, .I went back to my parents' house, too, to welcome my ancestors. 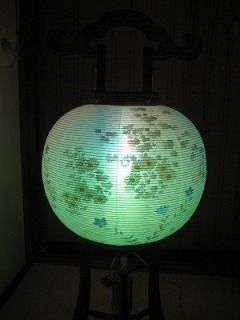 First of all, in the morning, my parents had prepared the Japanese lantern . This lantern, will be lightened brightly in order for the ancestors to find my house easily. And then, we prepare the animals which are used as rides for the ancestors to come back home. The dried plant called "Ogara,"
is used for the legs attached to cucumbers and aubergines . 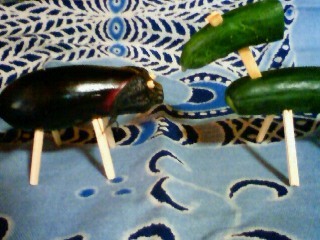 The cucumbers are used to be the horses, and the aubergines are used to be the cows. The ancestors will ride on the horses, which are fast to run , wishing "to be back at home quickly." On the other hand, it is said that when they go back to the heaven on Aug. 16th, we wish that "they can stay at this world for a long time," so they use the cows, which walk slowly. Other than the lanterns, we have the event called "Mukae-bi" as the sign to come back to the right house. We kindle "Ogara," which makes the way in the evening. 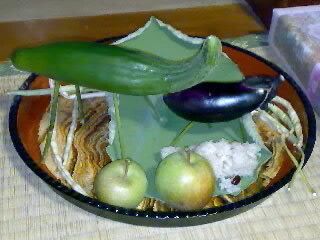 In my house, we fire "Mukae-bi" around 4:00 p.m., but the time to do "Mukae-bi" is differ by each house. Please welcome your ancestors according to your house's tradition. After you welcomed your ancestors, you need to prepare the meals every day until they leave. Please note that we use "Ogara" for the chopsticks. We split "Ogara" into the appropriate lengths, and make chopsticks and let the ancestors use them. 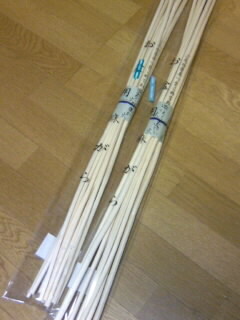 These "Ogara"-chopsticks, will be used as "Okuri-bi." Moreover, the fruits and vegetables as the oblations, are put on the leaves of the lotus. The ancestorswill spend the time together with you until the evening of Aug. 16th. Then on Aug. 16th, they will go back to where they should be, when we make the sign by "Okuri-bi." "Okuri-bi" is held by exactly the same way as "Mukae-bi," in the evening. In Kyotom there is a big event called "Gozan no Okuri-bi." The fires are lightened on the 6 mountains around the Kyoto city, in order to see your ancestors off. Please spend the days with your ancestors together during the Obon-holiday. 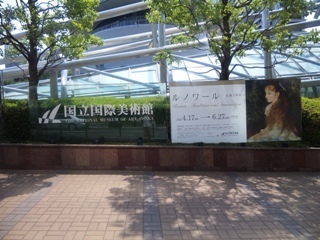 Now, at Kokuritsu kokusai bijutsukan in Osaka, ≪RENOIR Tradition and Innovation≫ is being held. 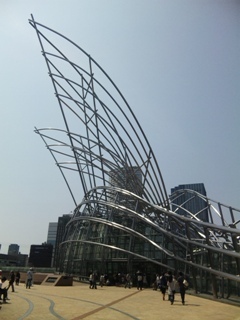 I went to The National Museum of Art in Nakanoshima, Osaka, with my boyfriend, by using Kintetsu railway and Keihan railway! The outward appearance of The National Museum of Art is so unique, and so cool. Same as me, there were a lot of people taking pictures outside. 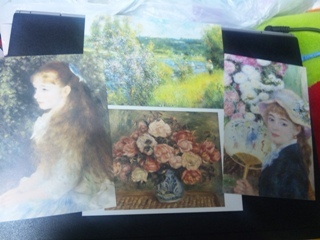 Pierre-Auguste Renoir, is a famous painter and impressionists, from France. Rather than the landscapes or the flowers, he is much more famous for his works of portraits, especially the ladies' portraits. There were as much as 85 works, and most of them were the portraits of the beautiful ladies. Of course, the portraits of the ladies are so beautiful, but my boyfriend and I were very impressed by the pictures of the landscapes and the flowers. After went through all the pictures, I bought four postcards of my favorite pictures. I like the pictur of the roses the best, placed at the bottom. Which would be your favorite picture, out of this four cards? 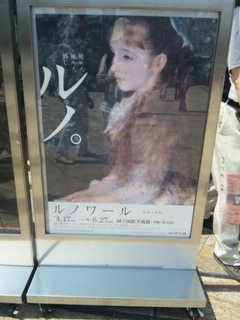 RENOIR Tradition and Innovation is held until July 27th, so those who have time to go, please do!! I practice badminton on Sundays. I usually play with my boyfriend twice or third times a month. My boyfriend's parents open a badminton club, and they bring up many excellent players. 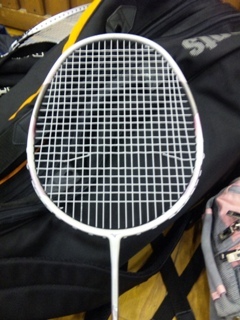 Chabumaru started to play badminton three years ago. So, I'm not good at playing it so much. Which means that it is an evidence that I have practiced so much. So, I got very happy! The part which was cut was a little bit low. If the part would be a little bit upper, I can hit the shuttlecocks can fly higher and I would be able to get more points easily and clearly. In June, there are 2-days of practices, including today. My boyfriend have been playing badminton for more than 20 years. My dream is that to join in the games with my boyfriend. In order to make that dream come true, I will practice very hard!! Do you have something that you concentrate on? 「Keizoku wa chikara nari.」is a proberb from the past. Which means, to continue what you like or what you want to do, will lead to your abilities, and moreover, not to quit however hard it will be, your dreams will come true. Please try hard and make your wish come true! I'm so sorry that I couldn't update this blog for a long time. I felt very sorry that there are many people who enjoy to see this blog, but I counldn't take the time to update. Everybody, have you finished to change the clothes? I am going to do it with my boyfriend tomorrow. I think everybody already knows that my hobby during the winter. 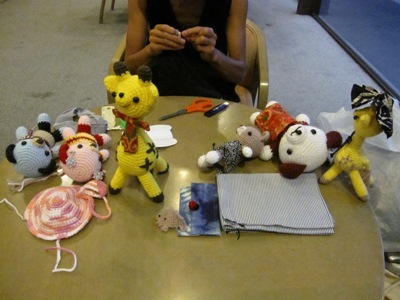 It is to make stuffed animals with out of wool. From May, I found a new hobby. 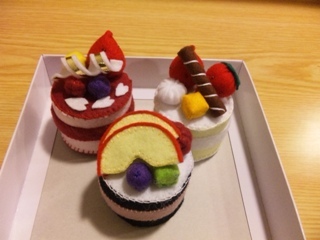 It is to make fake cakes out of felt. 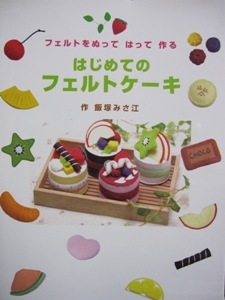 To make cakes out of felt, is very complicated, so, I need to concentrate very much, but it is very fun! If I become better to make cakes, I want to answer the requests from everyboday!! I haven't been able to update my blog recently. Those who are looking forward to reading this blog, I'm very sorry. From today, I' going to update every day, so please keep in touch with me by coming here. I guess most of you have already known, my hobby is "handicraft," especially "knitting." I make stuffed animals by knitting wool. The stuffed animals knitted with wool is called "Amigurumi." "Ami-" is from "amu (=to knit)," and "-gurumi" is from "Nuigurumi (=stuffed animals). Isn't it interesting how we made the word "Amigurumi?" I put my "amigurumi" up to auction, and it is bought by many kinds of people. Sometimes, those who had bought my works before gives me some request, and I make new works for them. 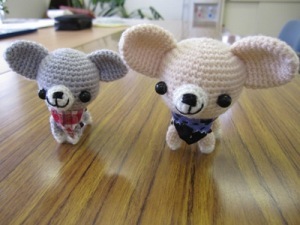 These two chihuahuas are made because I had an request from who bought my works before. I'm very happy that the people who bought my "amigurumi" love them. Whenever I make "amigurumis," I make a wish that they will be loved bu the person who buys them. 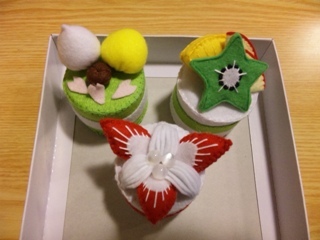 I'm going to make handicraft-cakes by using felt. I've never made anything by using felt, but I think I am good with my hands, so if I practice many times, I can make some works that can be sold through auction. I think you also know about this, that Yoshiemushi-sensei is also very good with her hands. 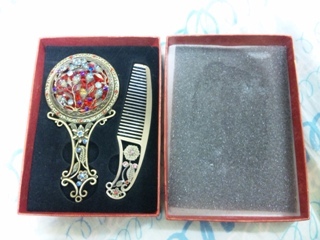 Yoshiemushi-sensei can make very beautiful cloths by using a piece of cloth. Do you know the bag we use to put in the whiteboard which we use during the studies, is made by Yoshiemushi-sensei. When I saw it for the first time, I was so surprised that it was so good!! Everybody, please collect the stamps and get the presents by studying with us!! 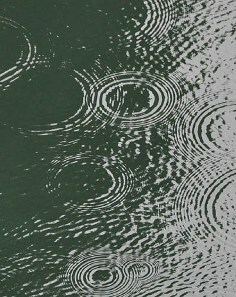 It was raining today, but I went out. It was raining, so I didn't go out. click here to jump to "Nihongo no ie" homepage! ・New information from "Nihongo no ie"